Moscow: What happened at Luzhniki? Black smoke covered the sky over southern Moscow yesterday just after noon. 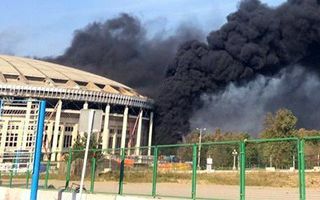 From afar it looked as if the national stadium at Luzhniki was burning, which was in fact what some news outlets initially reported. Thankfully it turned out not to be the case. Only some 20 square meters of disposed building materials were burnt, not challenging the overall structure. While fire and smoke quickly climbed along the façade and even reached inside the building, it was also extinguished fast. The Moscow construction supervision announced unplanned inspection of the entire site, although works will not be halted and they’re still ahead of initial schedule. Luzhniki, the 2018 World Cup final venue, is still expected to be delivered in 2016 instead of 2017.